Do You Have Any Needles or Grapes? Tonight we dragged our tree out…well, I should say my oldest son and his friend dragged it out…leaving a trail of needles and water behind. Contributing to the messiness of my floor. Today my floor has been an issue. I desperately wanted to ask her to leave and come back in 20 minutes. But oh did I want to. I was trying to pick up things unobtrusively…sneak things off the counter, put things in the sink, push things into drawers, pick up a larger crumb on the floor. I’m sure she could see my furtive attempts to clear the clutter. I don’t know this neighbor well so she rarely sees the inside of my house. But I believe I can safely say that EVERY time she stops by some sort of tornado has struck…well, 6 tornados – me included. Today was one of those days. It was back to school for my kids – both homeschooled and public schooled – and educational paraphernalia was strewn all over the counter, table, and foyer. I began a new program to become certified to teach and earn my Masters in education so I have to admit that I contributed to the school stuff everywhere. Calendars, bills, and other documents were stacked on a stool near the kitchen table because there was no room on the table. My son had started a drawing project in the family room and paper had slid off the sofa onto the floor. Oven buzzers were sounding and pots were bubbling on the stovetop. Sitting between the pantry and laundry room doors were 2 baskets of clean laundry waiting to be taken upstairs. The only good thing about my house was there were no dishes in the sink – and that, my friends, is a miracle! This unexpected visit was not one of my finer examples of hospitality…at least in the sense of my home being ready. I love having people over and enjoy welcoming them into our pandemonium. But sometimes… sometimes I want a little fair warning! It’s okay though. Just my pride being a bit wounded. When I pull into the driveway I have children climbing out of windows and/or falling over each other to get out of the same door. And the number of odds and ends that tumble out of my car at any given stopping point is staggering. My car is a giant purse…full of children, paper, shoes and goodness knows what else! Actually when I started this blog I was going to write about sweeping the floor – specifically the tree needles and some grapes that were dropped. I was thinking how the needles, although everywhere, were quite easy to sweep up…kind of like all the mundane issues of life. Those things that aren’t surprising or particularly difficult, but they seem to be everywhere. They take up time and energy, but they are doable. Then there are the things like grapes. Grapes…ugh. I can’t tell you how frustrating it was to try to sweep up those silly grapes. They went everywhere but where I wanted them to go. Those little buggers can roll fast and far! I could have leaned over and picked them up individually, but I didn’t have the energy to do it. 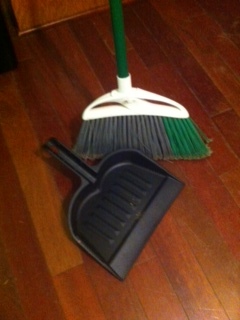 (long, long day) I just wanted them to go nicely into the dustpan. But nope. They went every which way. Unfortunately I couldn’t leave them lying about because grapes are magnets for feet. And squashed grapes are even more work…sticky work. My house is sticky enough thank you very much! I don’t know why I thought about the needles and the grapes…or why it struck me that it was so much like my life. Maybe I’m over thinking things…totally possible. I’m pretty tired. But what I realized is that God equips me to handle both things. Those needles are like the plethora of monotonous things that occur in any given day…like dirty dishes, cluttered counters, messy floors, loads and loads of laundry, and neighbors that stop by unexpectedly on a particularly messy day. But they are all things that God gives me the grace to handle if I will rest in Him each day. Part of that resting is finding my identity in Him rather than the state of me, my home, my children, my finances, my education, my work, my relationships, my marriage/divorce, my health…all of that is not defining. I am defined by Christ! And then there are the grapes…the things that roll around your life and cause trouble. They roll in with things like dealing with our ex-spouses or struggles with our children’s behaviors, financial worries or household issues, health crises or work concerns…you can probably add your own grapes to that list. And there are bigger grapes that spin everywhere, are impossible to catch, and often just end up squashed on the floor. These things are bigger things…heart issues, agonies that bring us to our knees, struggles and sorrows that linger, hurts that seem to take forever to heal…I’m sure you know what I mean. Those are some whopping big grapes. But thankfully our God is bigger than any grape…large or small. Needles or grapes all need to end up in the same place…and so do all our troubles and struggles and annoyances. All our stuff needs to end up in the dustpan of faith and handed over to our Heavenly Father. There is no amount of life messiness that God can’t handle. And He’s willing to handle it all. I’m more than happy to hand the broom and dustpan to Him…I’m tired of cleaning anyway. If I trust Him to take care of all those things, I can be peaceful no matter the state of my home. And that means that when people stop by I can rest assured that even if my house seems a bit muddled, I will not. I will be calm and able to focus not on my house, but my guest. If I trust Him, when the pains and sorrows of this life seem too much to bear I can find solace in His Word, peace in His presence, and comfort with His people. So sweep those needles and grapes toward Jesus and let Him deal with them all! His dustpan is big enough. I don’t know if that string of thoughts exactly works, but I hope that it blesses you in some way – even if it’s just a smile at my attempt to spiritualize a messy floor. Next Article What’s Your Choice?